Former first lady Barbara Bush was recovering Thursday following 2½-hour heart surgery to replace her aortic valve, hospital officials said. Family spokesman Jim McGrath said Bush was already up and talking Wednesday night in intensive care only hours after undergoing the procedure at The Methodist Hospital. Former President George H.W. Bush was at the hospital with his wife, McGrath said. The hospital said the former first lady was expected to be released in seven to 10 days. The surgery was scheduled last week after Bush, 83, experienced a shortness of breath, McGrath said. He said doctors determined the aortic valve had started to harden. Dr. Gerald Lawrie, a heart surgeon at the Methodist DeBakey Heart & Vascular Center, replaced the valve with a biologic valve, which is made of natural living tissue, the hospital said in a statement. Lawrie said the surgery went "extremely well." Bush's age may be "a little old for any heart operation," according to CBS News medical correspondent Dr. Jon LaPook, but experts say it's the best operation they do. "You know, these days it's getting more and more simple. But people do very well. The big risk is stroke. It's only a couple percentage point risk of that and also pump failure," said LaPook. Bush is expected to fully recover and resume her normal activities soon, Lawrie said. When left untreated, a hardened aortic valve can result in heart failure or sudden cardiac death, the hospital said. The valve, on the left side of the heart, can harden with age and become less effective. Symptoms of aortic valve disease include shortness of breath, chest pains and dizziness. Houston television station KRTK reported that Bush almost didn't want her children to know about the surgery because she didn't think it was a big deal. She is the mother of former President George W. Bush and former Florida governor Jeb Bush. The other Bush children are sons Neil and Marvin and daughter Dorothy. 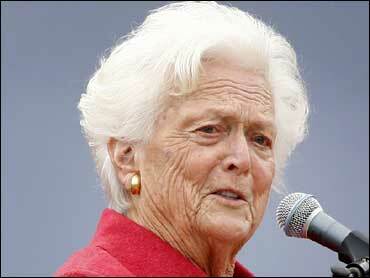 Barbara Bush underwent surgery in November for a perforated ulcer. The hospital said the two were unrelated. The former Barbara Pierce, daughter of the publisher of McCall's magazine, married George H.W. Bush in 1945 when he returned a hero from World War II. They had their first child, George, while still at Yale in 1946. A daughter, Robin, died in 1953 of leukemia a few weeks before her 4th birthday. Barbara Bush disclosed she was suffering from an overactive thyroid ailment known as Graves' disease when she lived at the White House. The disease causes teary eyes and double vision, according to her doctors.